Added sugar is everywhere — and not just the obvious sweet treats like cake, cookies, and soda. Sneaky sugars can also be found in foods like protein bars, salad dressing, yogurt, condiments, and nut butters. That makes it difficult to avoid sugar altogether. (Just ask anyone who’s attempted a paleo or Whole30 diet.) But you can at least take steps to replace artificial sweeteners and refined sugars with natural, plant-based substitutes. 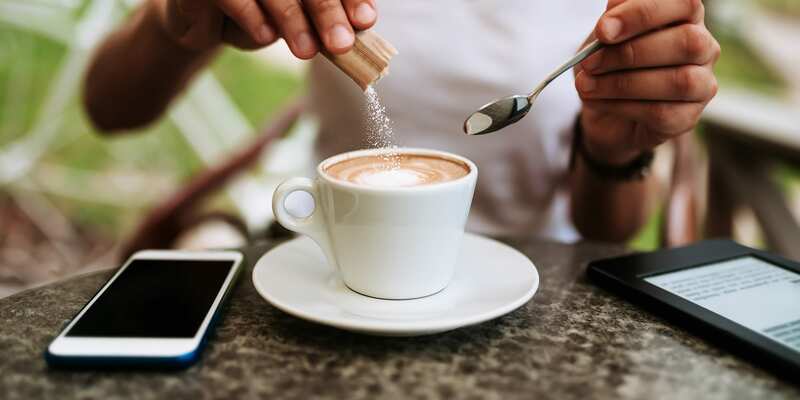 Here are six natural sugar substitutes to try when your morning cup of coffee or your favorite dessert needs a little extra sweetness. Unlike imitation syrups — which are typically made with corn syrup and imitation maple extract — the real McCoy is made by boiling down tree sap. (The nutrition label should have just one ingredient: 100 percent pure maple syrup.) Needless to say, its distinct maple flavor is perfect when drizzled on a stack of protein pancakes — and the natural sweetener also contains phytochemicals, naturally occurring plant compounds with antioxidant and anti-inflammatory properties. This “liquid gold” is made when bees transport flower nectar to honeycombs, where the nectar evaporates and thickens. The type of flower — like wildflower, avocado, or orange blossom — dictates the flavor and color of the honey, which means you can find a wide array of unique flavors to sweeten your tea, oatmeal, yogurt, dressings, and more. Even better, research suggests this tasty topping has antioxidant, antimicrobial, and anti-inflammatory effects. A little goes a long way with this zero-calorie sweetener, which is extracted from the Stevia rebaudiana Bertoni plant and is 50 to 350 times sweeter than table sugar. While the health and weight-loss benefits of stevia are still being researched, it can be useful for making lower-calorie versions of your favorite sweet treats — as long as the bitter aftertaste doesn’t bother you. Make sure to peek at the ingredients label and look for 100 percent stevia extract, because some varieties — particularly powder versions — include fillers and additives. Made from coconut sap, coconut sugar is available as a paste (which can be used like honey) or a powder (which can be used as a one-to-one substitute for white sugar). Just be aware that coconut sugar tends to get a “health halo” around it — while it does contain some minerals like iron and zinc, you’d have to eat a lot of coconut sugar to reap those benefits, so it’s better to get those essential nutrients from healthier sources. Still, it’s worth trying for the flavor, which is more full-bodied than many other sweeteners — similar to brown sugar — and not overly sweet like refined sugar. Monk fruit, a plant native to Southern China, is up to 250 times sweeter than regular sugar and has a slightly fruity flavor. While an acceptable daily intake of this zero-calorie sweetener has not yet been determined, research shows it’s non-toxic and may have antioxidant and antimicrobial properties. Like stevia, however, monk fruit may have a sometimes unpleasant aftertaste. And be sure to look out for unnecessary additives like dextrose on the ingredient list. This sweetener is made by pureeing chopped dates and hot water into a thick, creamy paste — you can make it yourself or pick up a store-bought version. Dates have been found to have antioxidant and anti-inflammatory properties, and they also provide some fiber and vitamin B6 — but, as with any sweetener, date paste should still be enjoyed in moderation.